Below is an excellent video showing how to get rid of washing machine smell. You know what I'm talking about right, when you open your washing machine door or lid and get a whiff of something not so great, right? Generally this smell is coming from bacterial growth or mold and mildew buildup. This can happen to both a top loading or front loading machine, but is especially a problem with front loaders because of the tight seal on the doors of these machines. The mold, mildew and bacteria build up for lots of reasons, including that your washing machine can be a warm dark damp place. If you normally wash a load or two a week using chlorine bleach and/or very hot water you are less likely to have a build up of mildew, mold and smell because these things naturally kill all that smelly stuff. However, if you accidentally leave clothes in the washing machine for a while, or don't let the washing machine dry out before closing the door completely you can get a smelly washer. The video below is very informative, and discusses how to clean the three areas of your washing machine which are most likely to get a build up of mold and mildew. Those three areas are your detergent drawer, your washing machine door seal, and the lint filter. clean the mold and mildew from the machine with a kitchen bleach spray and an old toothbrush, and how to wash the removable parts in hot water and bleach solution in your sink. To routinely (they suggest once a month) run the machine on hot water with a product designed to remove limescale and detergent buildup (see below the video for some recommendations). Tell me in the comments how these tips worked for you. You can share your tips for how to clean washing machine here, or read other tips already submitted. Here are some available washing machine cleaners you can use, on a routine basis, to keep your washing machine from developing a smell in the future. This just in!!! 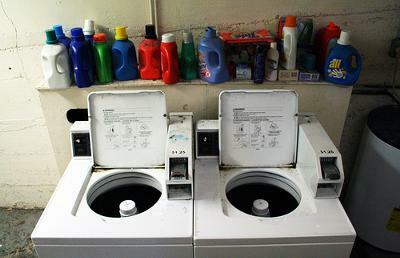 To get rid of the funky smell in a newer front loading washer NEVER SHUT THE DOOR between loads. It is that simple. There is a rubber gasket around the door that has a fold that catches paper clips, buttons, coins and soapy water. Wipe this out occasionally with a paper towel or rag with a little bleach on it. And DON'T shut the door. The gasket dries out and there is no mouldy smell. Couldn't be simpler. Or cheaper.